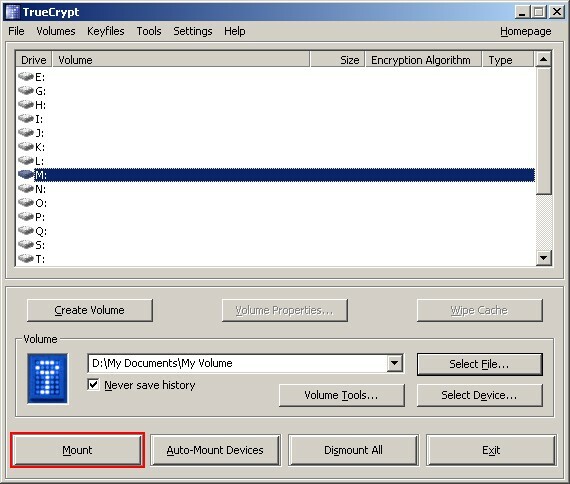 This chapter contains step-by-step instructions on how to create, mount, and use a TrueCrypt volume. We strongly recommend that you also read the other sections of this manual, as they contain important information. If you have not done so, download and install TrueCrypt. 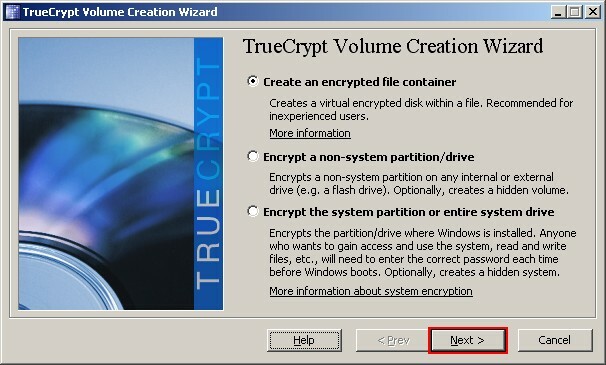 Then launch TrueCrypt by double-clicking the file TrueCrypt.exe or by clicking the TrueCrypt shortcut in your Windows Start menu. The main TrueCrypt window should appear. Click Create Volume (marked with a red rectangle for clarity). 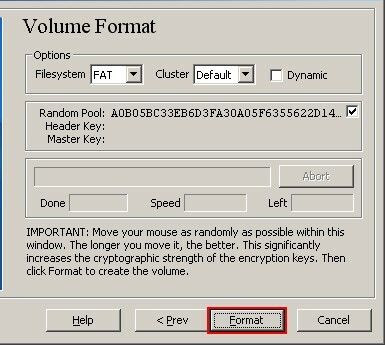 In this step you need to choose where you wish the TrueCrypt volume to be created. 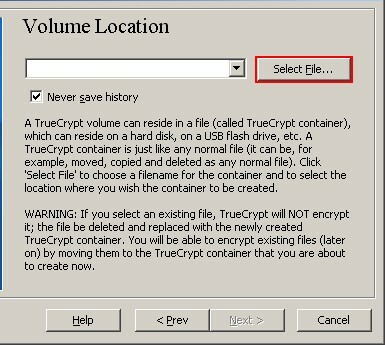 A TrueCrypt volume can reside in a file, which is also called container, in a partition or drive. 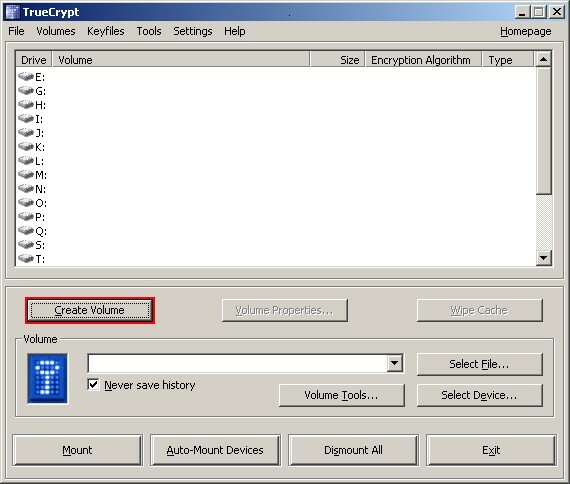 In this tutorial, we will choose the first option and create a TrueCrypt volume within a file. Note: In the following steps, the screenshots will show only the right-hand part of the Wizard window. 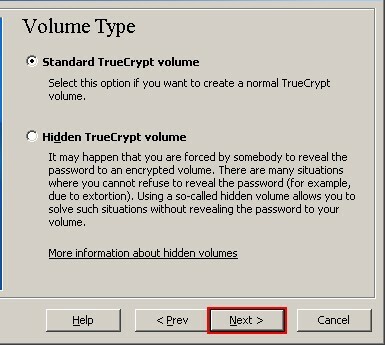 In this step you need to choose whether to create a standard or hidden TrueCrypt volume. 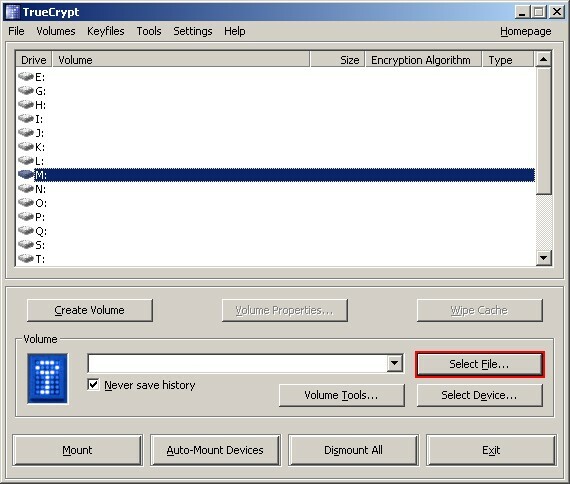 In this tutorial, we will choose the former option and create a standard TrueCrypt volume. In this step you have to specify where you wish the TrueCrypt volume (file container) to be created. Note that a TrueCrypt container is just like any normal file. 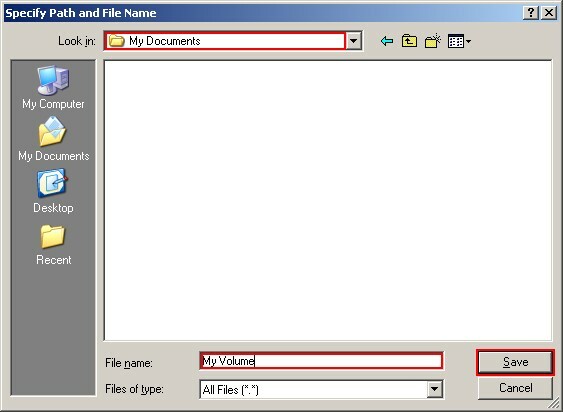 It can be, for example, moved or deleted as any normal file. It also needs a filename, which you will choose in the next step. The standard Windows file selector should appear (while the window of the TrueCrypt Volume Creation Wizard remains open in the background). In this tutorial, we will create our TrueCrypt volume in the folder D:\My Documents\ and the filename of the volume (container) will be My Volume (as can be seen in the screenshot above). You may, of course, choose any other filename and location you like (for example, on a USB memory stick). 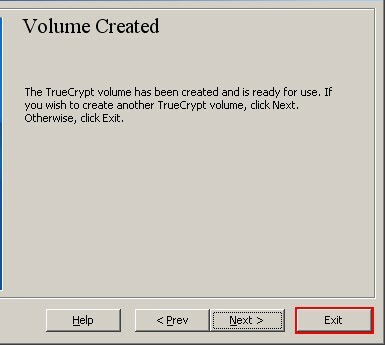 Note that the file My Volume does not exist yet – TrueCrypt will create it. Select the desired path (where you wish the container to be created) in the file selector. Type the desired container filename in the File name box. * Note that after you copy existing unencrypted files to a TrueCrypt volume, you should securely erase (wipe) the original unencrypted files. There are software tools that can be used for the purpose of secure erasure (many of them are free). 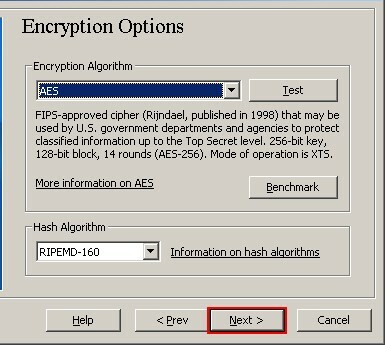 Here you can choose an encryption algorithm and a hash algorithm for the volume. If you are not sure what to select here, you can use the default settings and click Next (for more information, see chapters Encryption Algorithms and Hash Algorithms). 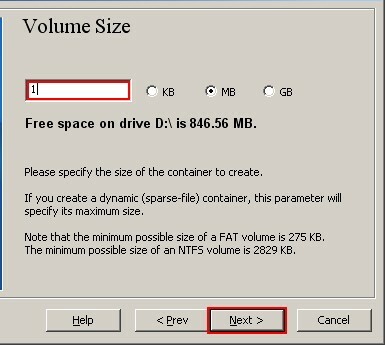 Here we specify that we wish the size of our TrueCrypt container to be 1 megabyte. You may, of course, specify a different size. After you type the desired size in the input field (marked with a red rectangle), click Next. This is one of the most important steps. 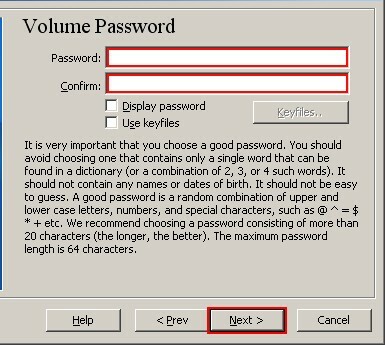 Here you have to choose a good volume password. Read carefully the information displayed in the Wizard window about what is considered a good password. After you choose a good password, type it in the first input field. Then re-type it in the input field below the first one and clickNext. 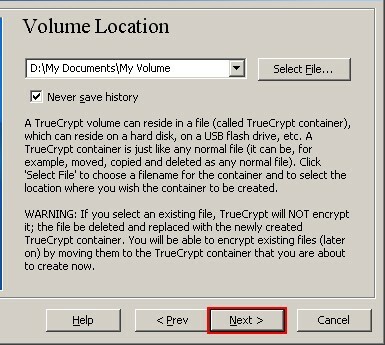 We have just successfully created a TrueCrypt volume (file container). In the TrueCrypt Volume Creation Wizard window, clickExit. Select a drive letter from the list (marked with a red rectangle). This will be the drive letter to which the TrueCrypt container will be mounted. Note: In this tutorial, we chose the drive letter M, but you may of course choose any other available drive letter. In the file selector, browse to the container file (which we created in Steps 6-11) and select it. Click Open (in the file selector window). In the main TrueCrypt window, click Mount. Password prompt dialog window should appear. Type the password (which you specified in Step 10) in the password input field (marked with a red rectangle). The virtual disk is entirely encrypted (including file names, allocation tables, free space, etc.) and behaves like a real disk. You can save (or copy, move, etc.) files to this virtual disk and they will be encrypted on the fly as they are being written. If you open a file stored on a TrueCrypt volume, for example, in media player, the file will be automatically decrypted to RAM (memory) on the fly while it is being read. Important: Note that when you open a file stored on a TrueCrypt volume (or when you write/copy a file to/from the TrueCrypt volume) you will not be asked to enter the password again. You need to enter the correct password only when mounting the volume. You can open the mounted volume, for example, by double-clicking the item marked with a red rectangle in the screenshot above. You can also browse to the mounted volume the way you normally browse to any other types of volumes. 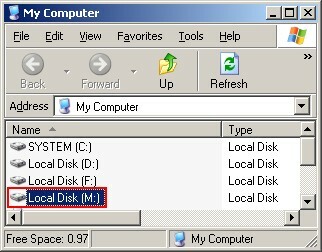 For example, by opening the ‘Computer’ (or ‘My Computer’) list and double clicking the corresponding drive letter (in this case, it is the letter M). Instead of creating file containers, you can also encrypt physical partitions or drives (i.e., create TrueCrypt device-hosted volumes). To do so, repeat the steps 1-3 but in the step 3 select the second or third option. Then follow the remaining instructions in the wizard. 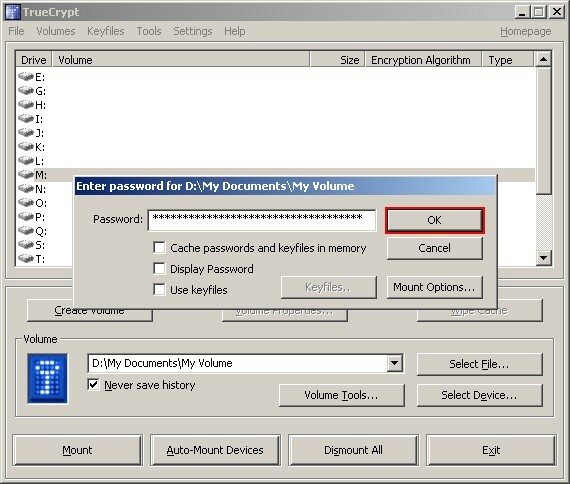 When you create a device-hosted TrueCrypt volume within a non-system partition/drive, you can mount it by clicking Auto-Mount Devices in the main TrueCrypt window. For information pertaining to encrypted systempartition/drives, see the chapter System Encryption.